After a day spent in the freezing waters of Ocean Beach for Leap's Sand Castle Contest (to help fund raise arts in education), nothing felt better than a warm shower and some non-sandy clothes (here's what my team made!). I was one of the few gals helping lug water from the ocean to the team and lemme just say...I'm still sore! I never built a proper sand castle before, so this was an amazing experience for me as much as it was for the kids! Thankfully, the winds picked up after we were done building our sand castle but it definitely made me want to bundle up as much as I could later. The winds actually made for the perfect opportunity to pull out my year-old thrifted find. This jacket is the definition of cozy and warm. It's a jacket I would never have pulled for myself before but I adore the 3/4-length sleeve, the collar and the subtle pattern. It makes me feel so much cooler than I am. That jacket looks so comfy! Did you take any pictures of your finished sand castle? I can't say that I have ever done that either! Sounds fun! and for a good cause, can't beat that! Gorgeous outfit! I love the shoes :) Sounds like you had fun! You look lovely! Gorgeous sunnies and outerwear. I love when clothes make me feel cooler than I am as well, lol. And it sounds like that was a really fun way to do a fundraiser! What am I saying, though? You always look like a superstar! I love that jacket! So glam! I love the beanie and that fur coat! you look great! Wow, this jacket was such a great find! Looks uper warm and cozy. It's starting to get colder and I'm so happy! Love to bundle up inside and outside the apt. Wow, this is such a super chic outfit! You look fabulous! The sandcastle competition sounds and looks like so much fun!! Love the jacket and the punch of red on the hat. I love this jacket, it looks so warm and cozy! What a great thrifting find! 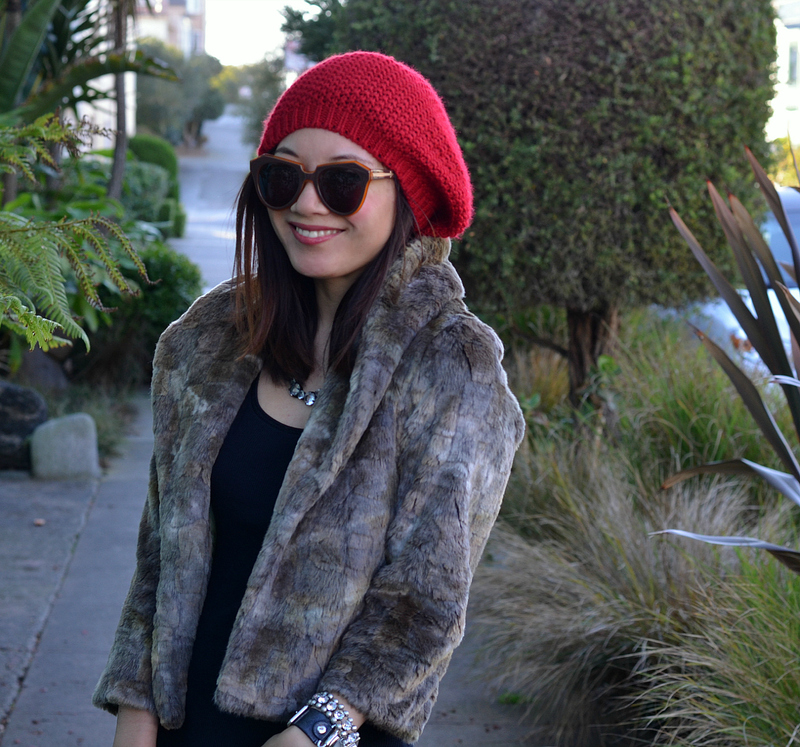 I love these slouchy hats for fall and winter! 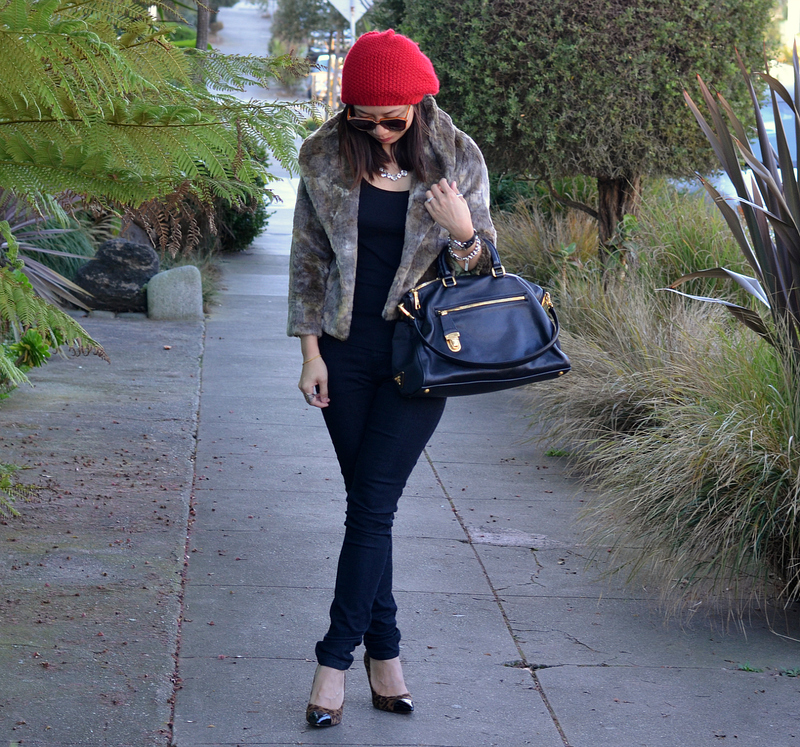 love the red beret! you look so gorg my dear. xO! Absolutely loving the red beanie. So chic! Love your jacket & the slouchy hat looks so great on you!! That looks so comfy and cosy! I found a similar jacket at TK Maxx about two or three weeks ago and couldn't decide if I should buy it or not. I didn't and then I regretted it badly! It's not available now... so, you're really a lucky girl having a so fluffy jacket, that goes always! Hi, dear) thank you for stopping by my blog and a cute comment you had left, glad to meet you!!! what a cute outfit! 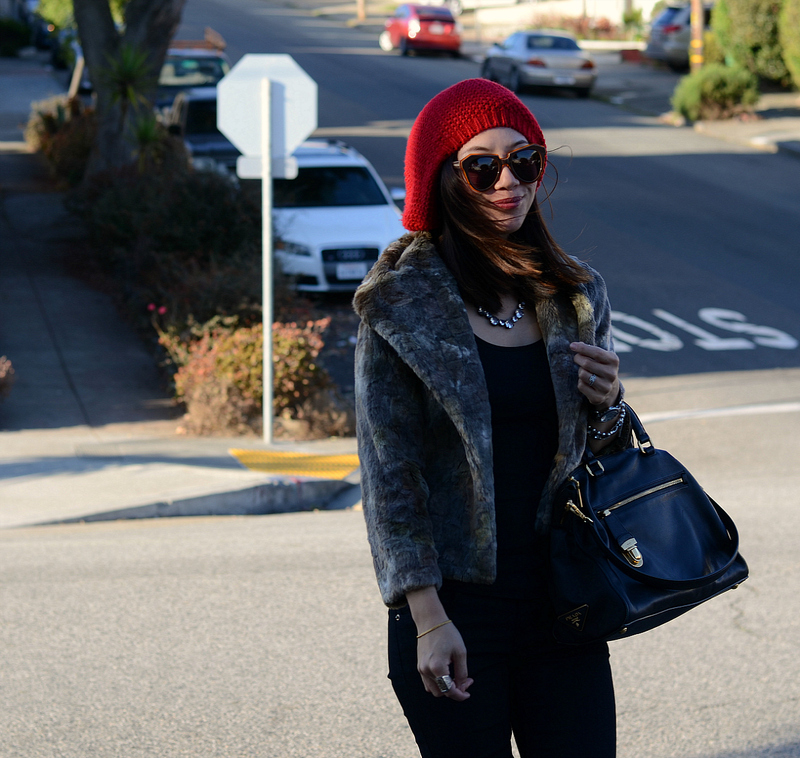 that jacket and hat are so cute together, I hope you can visit my blog sometime! You look amazing! Love your whole outfit! Such a cute jacket! And, I love your bag! Your team's sand creation was pretty awesome. I love yours a lot, you've got great style. I absolutely love love love those shoes! Ok I'm pretty sure I'm head over heels in LOVE with your style! And I LOVE that you are an SF Blogger too!! YAY!!! Seriously your jacket is AMAZING! I'm SO happy you stopped by my blog because now I found yours! I'm your newest follower! I hope you stop back by my blog so we can stay in touch! Great look and great blog! Thank you for visiting mine, I hope you liked it! I really love your red beanie! it's so cute! love the way you styled it! Ooh, like this look a lot. Warm and cozy, and chic! sounds like a very eventful weekend! good for you :). I love those sunnies! Love the coat!! Nothing like a piece to keep you warm and looking great. Now following! Love your jacket girl, it's so glam! Thank you so much for visiting my blog! I'm following you now on GFC and Bloglovin:)! On another note...You look so fabulous in this outfit! I love your hat and shoes:)! Nice look! I love the outfit especially the red beanie and the shoes. I LOVE that gorgeous coat, and that red hat is the cutest! you look lovely! what a great bag! Your sandcastle is amazing! I wished I lived on the beach :) This outfit is indeed cozy, what a great find that jacket was! Oh i love that jacket, so glam. 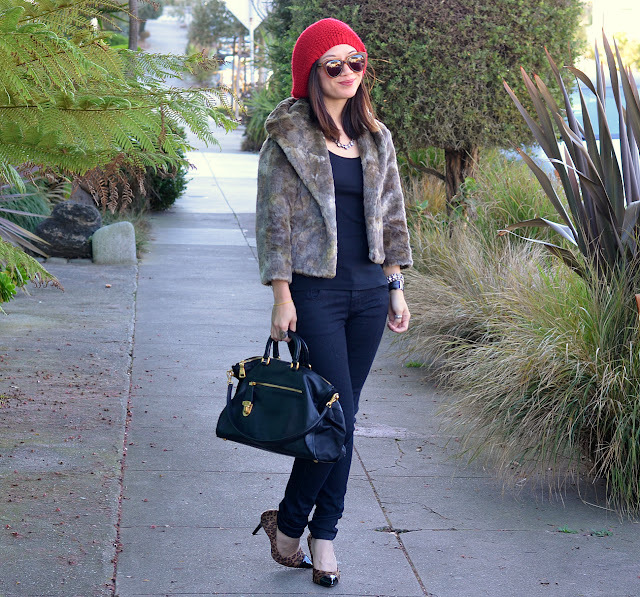 The beanie is a fun twist, playful ! Thanks a lot for the visit in my blog and sweet thoughts. I love this look! 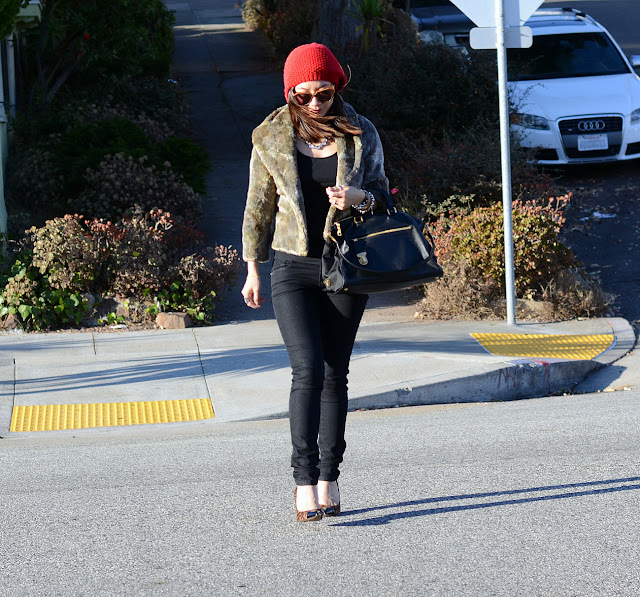 A little fur, a little leather, a little pop of color, a little leopard print... and not too much of anything. Great outfit.